Help a farmer seek revenge on the goblins who killed his wife. Talk to a grieving farmer about his recently deceased wife. Avenge the wife's death by killing a lot of goblins. Return a keepsake to the grieving farmer. In Harm's Folly, a remote one-house settlement northeast of the Imperial City, you will meet Corrick Northwode, a farmer who recently lost his wife Kayleen. If you talk to him about Avenge, he will tell you a sob story about how the local goblins killed Kayleen, and ask you to retrieve a Jade Amulet that the goblins snatched from her body. If you have a hard time finding Corrick, or if he doesn't have the Avenge topic, go around to the east side of the farmhouse. There you will find Kayleen's gravestone. 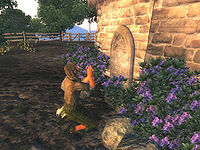 Place your icon over the gravestone, and it will suggest that you activate it, which is evidently how you can pay your respects to Kayleen. A short time later, Corrick should appear and be willing to start the quest. The goblins live in the nearby Exhausted Mine, which should have appeared on your map, just to the southwest of Harm's Folly. The entrance is usually guarded by two goblins; you'll meet a lot more inside. You have to work your way through to the last room in the third zone, where you'll find the Goblin Netherboss. He has the Jade Amulet on him. Take the Amulet back to Corrick in Harm's Folly. He will be very thankful, and as a reward will provide you with six leveled gems (see the reward table). He will also suggest that you pay your respects to his wife again. If you stop by the gravestone, you will receive the blessing Kayleen's Grace (Fortify Health 30 points, Fortify Fatigue 30 points, 600 second duration). You can revisit her gravestone as often as you like to receive this blessing. In unpatched versions of the game, there is a bug that can occur and prevent Corrick from acknowledging that you have brought him the amulet. It is also possible to start this quest without meeting Corrick, if you enter Exhausted Mine on your own. Your diary will recognize the Jade Amulet when you pick it up and start the quest. However, Corrick will not necessarily recognize the amulet when you take it to him (see Bugs). Due to the way the Netherboss is leveled, at high levels it can be significantly weaker than the other Goblins encountered during this quest. If you have previously completed the quest No Stone Unturned, it may not be possible to complete this quest. When you bring Corrick the amulet, he will not recognize that you have it in your possession and will not take it from you. In his grief, Corrick's sense of direction has evidently taken a hit. He tells you that Exhausted Mine is not far to the southeast, when it's actually to the southwest of his house. 10 I've found a jade amulet with the inscription "For Kayleen" in the possession of a Goblin boss. This must have been stolen from someone. I should hold onto it until I locate the owner. 20 I've come upon a sad Breton named Corrick Northwode at Harm's Folly settlement. It seems a goblin war party attacked his home, killed his wife and retreated back to their lair, Exhausted Mine. Now he wants me to go there and recover his wife's Jade Amulet. 30 I've recovered Kayleen's Jade Amulet. I should return it to Corrick at Harm's Folly. 100 Finishes quest Corrick Northwode was overjoyed to get back his wife's Jade Amulet. He thanked me by rewarding me with gold he had recovered from Exhausted Mine long ago. 200 Finishes quest With Corrick's death, it's impossible to complete this quest. It is possible to use the console to advance through the quest by entering setstage SQ03 stage, where stage is the number of the stage you wish to complete. It is not possible to un-complete (i.e. go back) quest stages. See SetStage for more information. This page was last modified on 11 March 2014, at 02:02.